Photobucket is one of the popular image hosting sites which hosts billions of images. If you use photobucket for hosting images this Firefox add-on comes handy, it allows you to upload images from the web in one click. The extension is simple to use, download the add-on from here and after installing you need to enter your photobucket credentials, once you done you can upload any image to your account. 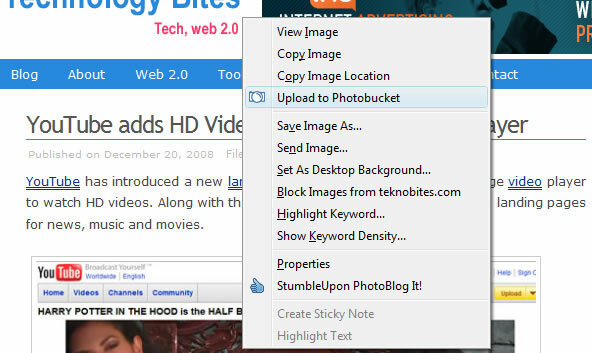 It adds a link “Upload to Photobucket” to your right click context menu in Firefox, when you want to upload right click your mouse on any image and select upload to photobucket, the image will be uploaded immediately. The extension is experimental, that means you need to login to Mozilla website before you can download the add-on.